The life of a lawn can be a stressful one. The odds are against your lawn, and many different elements are working to keep it from reaching its full, lush and green potential. That doesn’t mean you can’t do anything about it! In the past few weeks we have gone from warm days and cool nights, to hot days and warm nights. The overexposure of heat to your turf can be devastating, and unless you can block the suns rays, there isn’t much you can do about the heat. Heat isn’t the only stress wreaking havoc on your lawn, however. The other two stresses are lack of water and mowing stress. Though we can’t fix the heat, we can surely do something about these two! Nafziger Landscape Services, located in Greer, SC has these tips to follow to keep your lawn looking great this year! Lack of Water – We are starting to see exceptionally hot days with a lack of rain to supplement it. 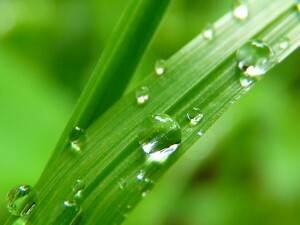 So, if water is not finding its way to your lawn naturally, bring the water yourself! This is the time of year to start deep root watering, but how do we do that? Deep Root Watering – Instead of watering every other day to achieve the needed 1.0”-1.5,” water 1-2 days in a row, then don’t water the next 4-5 days. This provides deep root watering and allows your soil pores to open for oxygen. Sharpen those Blades – Mower blades must be sharp or instead of cutting you will be tearing your lawn. If your leaf blades have brown tips 2-3 days after you mow, your mower blades may need to be sharpened. Rule of thirds – Mow your lawn at least every 7 days in the growing season. Never mow more than one-third of the grass leaf at a time. Don’t Catch those Clippings – If you are mowing at the correct height every 7 days, you do not need to catch your grass clippings. Clippings contain beneficial nutrients and do not build harmful thatch. Change directions – Change your mowing direction each time you mow. This ensures a more even cut and grass blades will be less likely to develop into a set pattern. Height matters – Mowing height is extremely important. Know your grass type and mow at the correct height for the time of the year.